Hello everyone! October is a busy month for birthdays around here, so the Featured Stamper Challenge on Splitcoaststampers on Sunday inspired me to get a head start on creating the birthday cards I will need for next month. 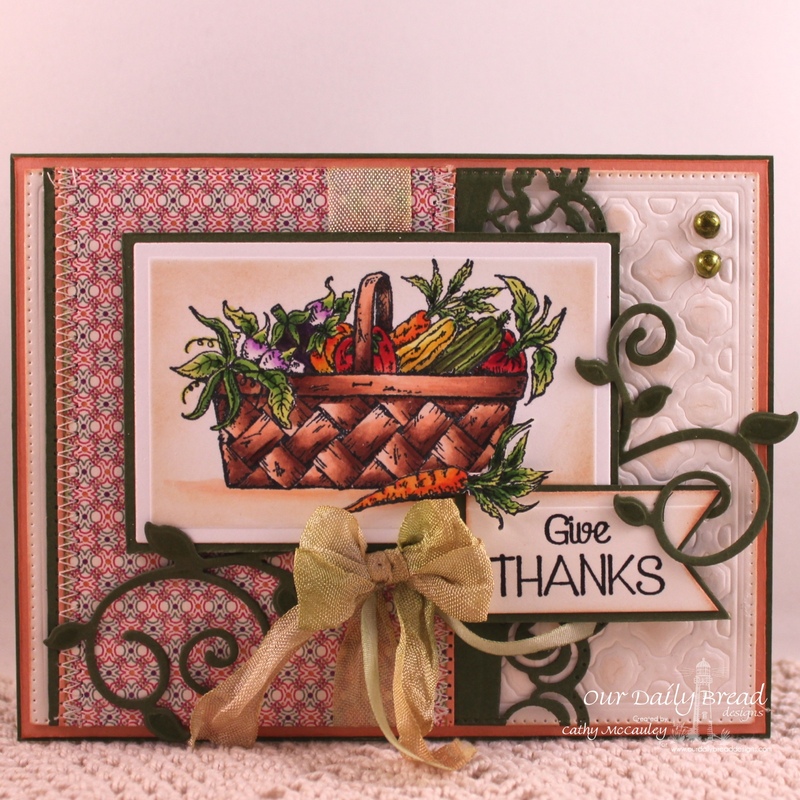 Penny Strawberry was the featured stamper and this Thank You card inspired mine. 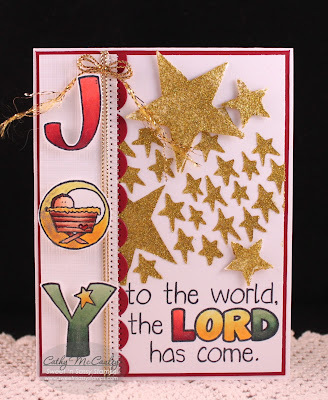 Creative Nugget: All supplies used on this card are by Our Daily Bread Designs. The top part of the background was embossed with the Boho Background Die while three matted rectangles cut from papers from the Rustic Beauty Collection were mounted to the bottom. The whole panel was cut with the Flourished Star Pattern Die leaving a pierced border around the edge…love this! 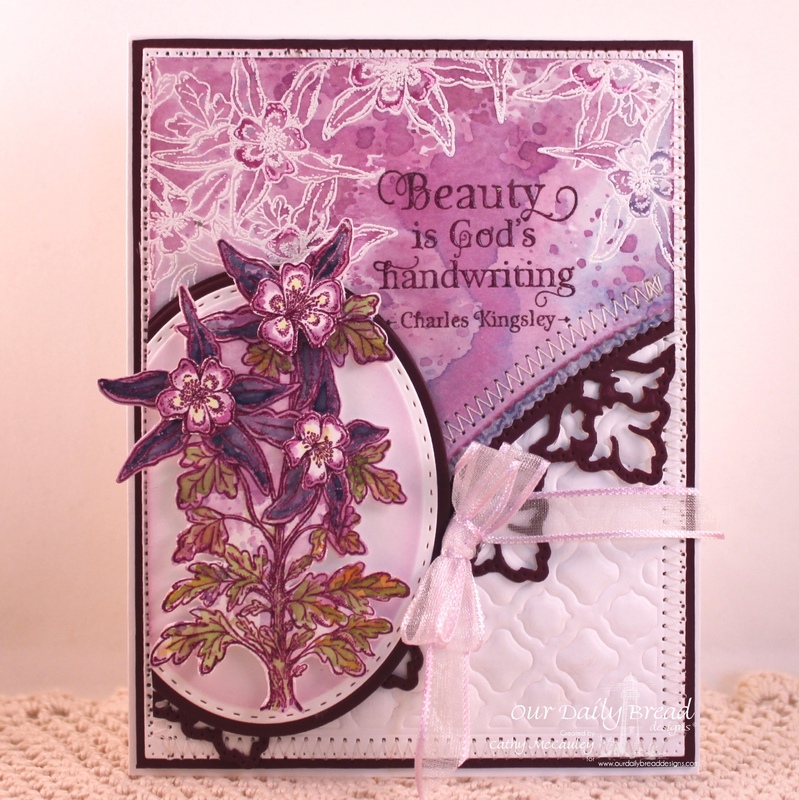 A Beautiful Border die cut separates the top from the bottom. The Pretty Posies Die set was used to create the flowers and some of the foliage. 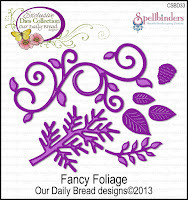 The leafy flourish was cut with one of the Fancy Foliage Dies. A sentiment from the Ornate Border Sentiments stamp set was stamped on Stitched Ovals. Some silk ribbon and gold beads were added to finish the card. Hello, dear friends! The best thing about winter is hot chocolate! I love looking at the freshly fallen snow…but the cold weather…that I can do without! LOL! Winnie's Winter Wishes, a new Sweet Perks Club Bundle just released by Sweet 'n Sassy Stamps, is perfect for sending warm winter wishes. 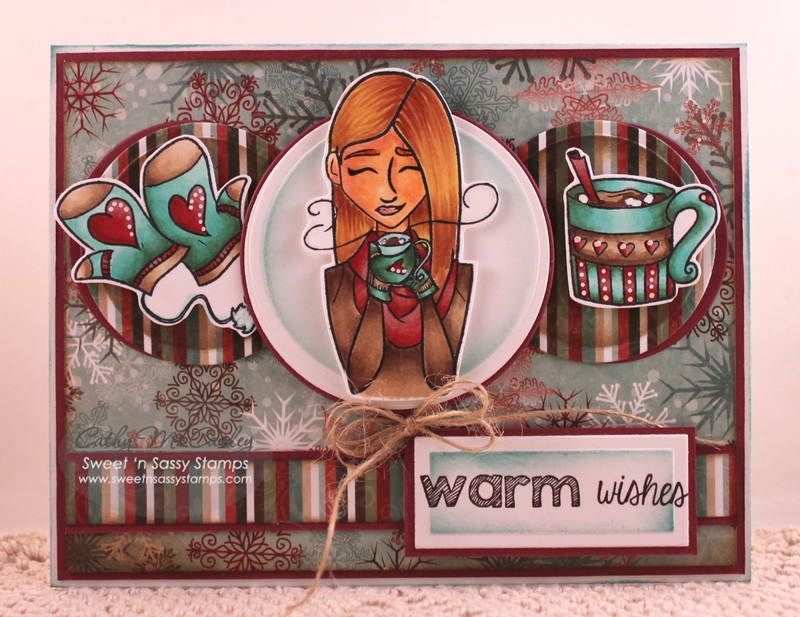 Creative Nugget: The images from the Winnie's Winter Wishes set were colored in warm, toasty colors with Copic Markers. The coordinating Winnie's Warm Wishes Dies made it easy to pop onto this card using the Mojo Monday Sketch for this week as the inspiration. The Season's Greetings papers are by Moxie. Welcome, my friends! 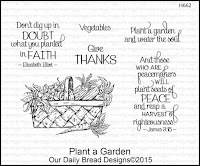 Today we are taking a look back at Our Daily Bread Designs September 2015 Mid-Month Release. 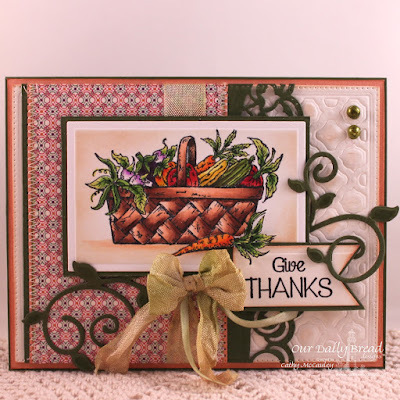 The floral and veggie stamps and dies released by Our Daily Bread Designs in the middle of September were gorgeous as you will see as you hop to each of the designers' blogs! My sample card today uses the new Plant a Garden stamp set. Creative Nugget: Love the Boho Background Die to create texture and that is what was used on the Vintage Cream card stock mounted to the card base. A piece of paper from the Beautiful BohoCollection was stitched to green card stock cut with one of the gorgeous Leafy Edged Border Dies. Seam binding was dyed and tied around this panel. The veggie basket from the Plant a Garden stamp set was colored with Copic Markers, mounted to green card stock and popped onto the card with foam tape. The sentiment was stamped on a modified Pennant and swirls of Fancy Foliage added to finish the card. 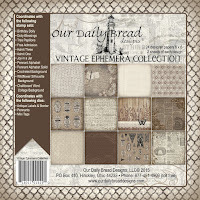 To see more gorgeous samples with these fabulous products head on over to the Our Daily Bread Designs Blog. To see the details for each project, click on the links below to visit all of my talented Sister Sticks and leave a little love behind! Welcome, my friends! 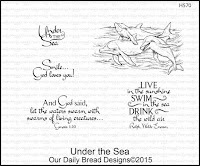 Today we are taking a look back at Our Daily Bread Designs September 2015 Release. 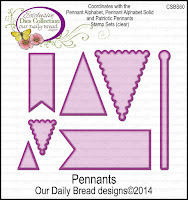 Get ready to feast your eyes on the beautiful projects that the fabulous Breadsticks have prepared for you today using the new September stamps and dies from Our Daily Bread Designs! Creative Nugget: The three different panels were cut with the Leafy Edged Borders and matted with brilliant blue card stock. The yellow panel was sprayed with Dylusions ink sprays and embossed with the Sunburst Background Die. 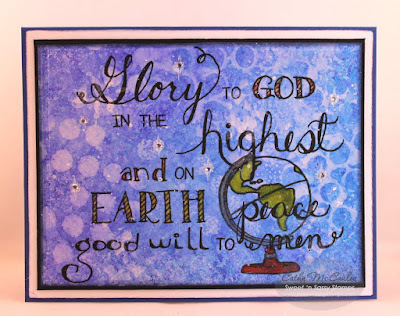 The middle panel was made by pressing different blue distress inks on a stencil, squirting it with water, and pressing it onto a piece of mixed media paper and embossing it with the Faithful Fish Pattern Die. The final panel was cut from a piece of paper from the Vintage Ephemera Collection. 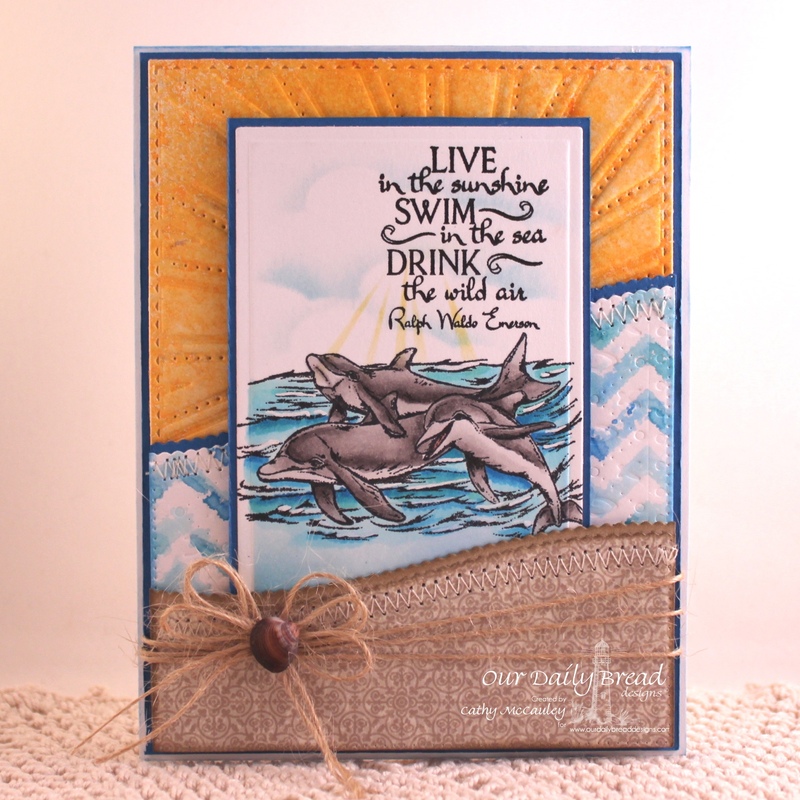 The dolphin image from the Under the Sea set was stamped, colored with Copic Markers and cut with a Spellbinders Matting Basics Die. A mask cut with the Clouds & Raindrops Die was used to sponge the clouds. Some jute and a small shell were added to finish the card. 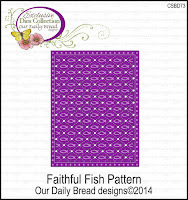 To see all the wonderful projects made with the September 2015 release, hop on over the the Our Daily Bread Designs Blog. Click the links below to see the details for each project. Hello friends! What's your birthstone? 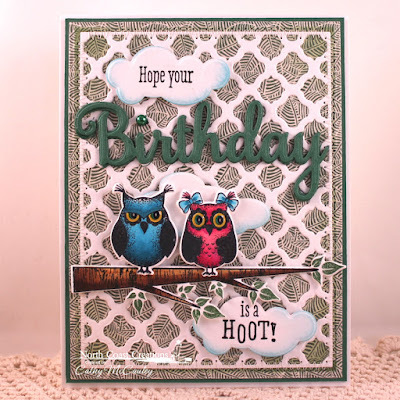 That's the question on Splitcoaststampers' Ways To Use It Challenge for today to create a card using your birthstone and one neutral color. Since September is my birth month, sapphire is my birthstone. It was easy to come up with a blue and white card using the new We Three Kings stamp set just released by Sweet 'n Sassy Stamps. Creative Nugget: This card was actually a failed attempt at the emboss resist technique. The Cobalt Archival ink stuck to the embossing creating a lighter blue color that did not wipe away. Since I did not have time to redo it, I left it as is…the look is growing on me…another Christmas card is finished! Hello friends! 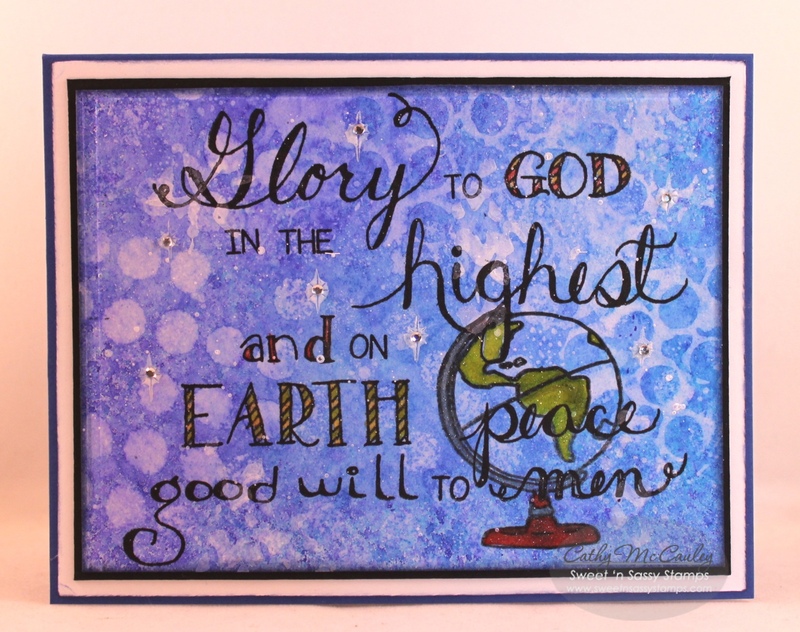 It's time to start working on my Christmas cards for this year and Our Daily Bread Designs is making it easy with these new products being offered as a pre-order. 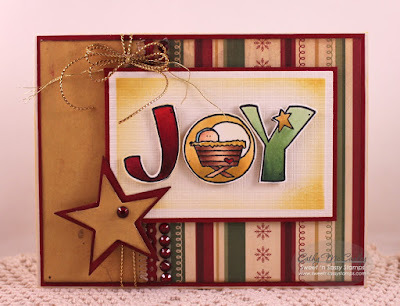 The ornament stamp sets and coordinating dies can be used to create elegant Christmas cards. 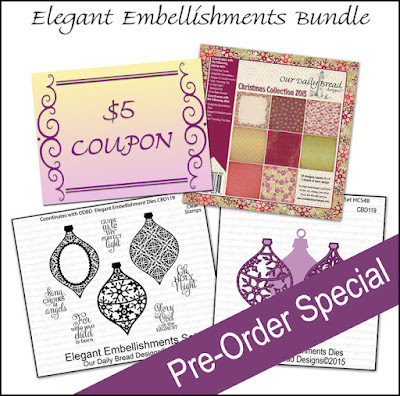 The Elegant Embellishments Bundle was used to create my samples. Creative Nugget: The Vintage Cream panel was cut with the Flourished Star Pattern Die and two ornaments were cut from the panel with the patterned ornament dies from the bundle. The cut outs were gold embossed and added to the card after everything was assembled. The sentiment from the Elegant Embellishments stamp set was gold embossed and the Boho Background Die was used to lightly emboss the panel. Some Christmas Collection 2015 papers were placed behind the ornament cut outs and stitching added. 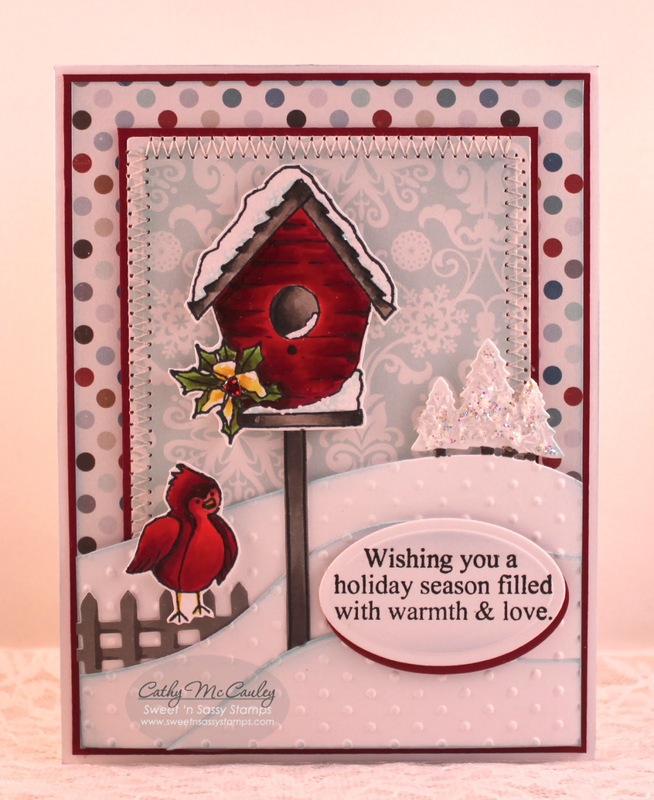 A topper made with the Leafy Edged Border Dies and a coordinated pattern from the Christmas 2015 Collection was added. One extra ornament was gold embossed on red card stock. The ornaments were hung with gold metallic thread and pearls added to finish the card. 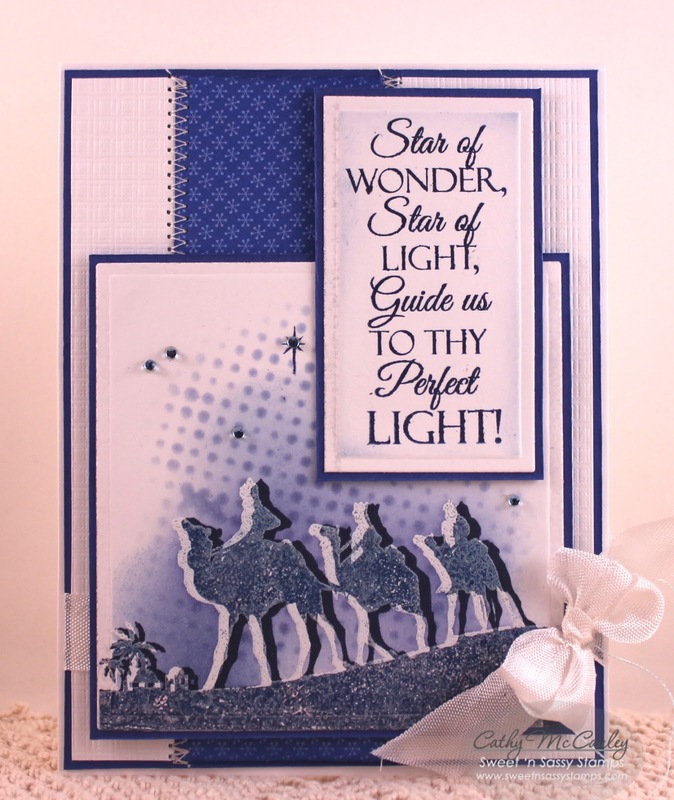 Creative Nugget: The Christmas 2015 Paper Collection, the Splendorous Stars Die, and the Flourished Star Pattern Dies were used make the layers which were stitched together to create the front of this card. 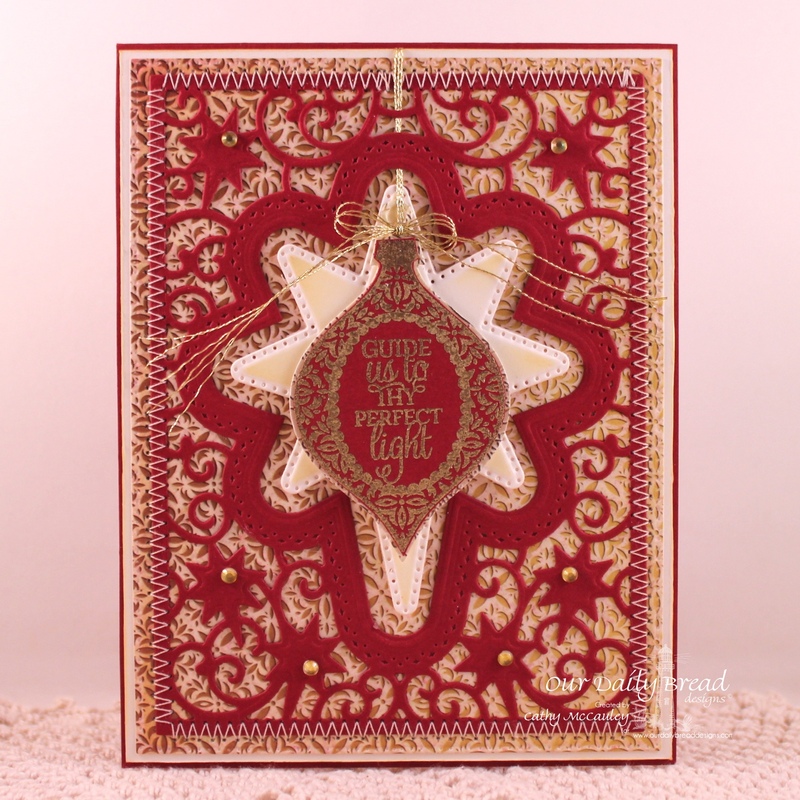 The sentiment and ornament from the Elegant Embellishments stamp set were gold embossed on red card stock, cut with the Elegant Embellishments Dies, and hung with gold metallic thread. A few rhinestones were added to finish the card. 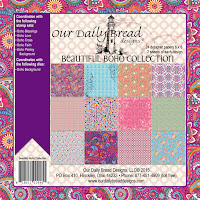 To see the other bundles and products being offered in this pre-order release head on over to the Our Daily Bread Designs Blog. To see more beautiful samples made by the talented Breadsticks, click the links below. Hope you've been inspired by your visit…have a blessed day! Hello friends! 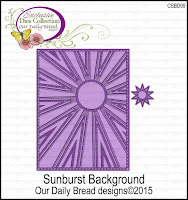 Welcome to the Our Daily Bread Designs September 2015 Mid-Month Release! 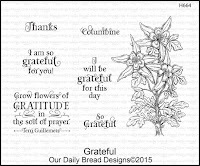 The stamps and dies Our Daily Bread Designs is releasing today are perfect for expressing your gratitude not only during the fall season, but all year long. Wait until you see the gorgeous creations the Breadsticks have prepared for you! Three randomly selected winners will each receive a $25 gift certificate to the ODBD Store, to be used toward the purchase of ODBD Stamps found in the "stamps column" of the website just for commenting on the Design Team cards! You have until September 15, 2015 at 9:00 p.m. EDT to leave your comments on the Designers' Blogs for a chance to win! The Winners will be posted on the ODBD Blog on September 16, so be sure to check back there to see if you won! My first sample was made using the Grateful stamp set. Creative Nugget: A Neenah Solar Crest panel cut and embossed with the Boho Background Dies was stitched to a Blackberry Bliss mat and attached to a card base. The Columbine flower from the Grateful stamp set was white embossed around the edges of another white panel. Watered down distress inks were dabbed unto the panel, dried with a heat tool, and cut with one of the Leafy Edged Borders. The Leafy Edged Borders were also used to cut a blackberry mat and paper from the Christian Faith Collection. These were all layered, stitched, and added to the top of the card. Oval and Stitched Ovals were layered and added to the left side of the card. 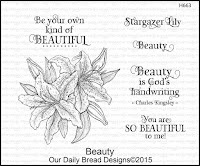 A sentiment from the Beauty stamp set was embossed as well as the columbine flower. The flower was watercolored with distress inks, fussy cut, and added to the oval. 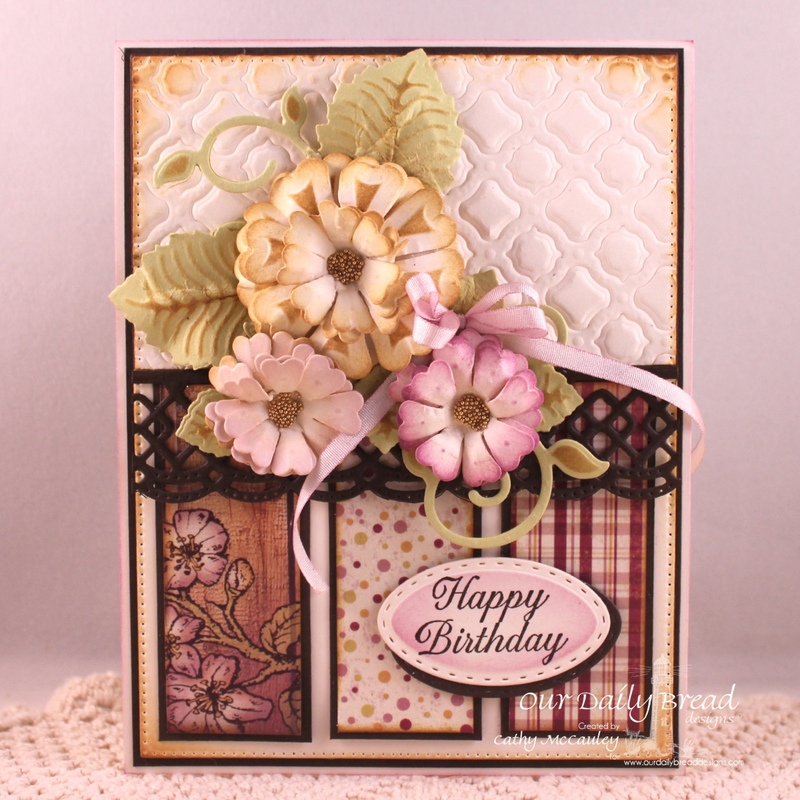 A few extra flowers were cut and popped over the columbine for dimension and a bow added to finish the card. Beauty was used for my second sample. Creative Nugget: A Fancy Foliage Die was used to cut a flourish from paper from the Blushing Rose Collection and a panel of the same paper was added to a card base. The Leafy Edged Borders were used to cut panels of pink card stock and Vintage Cream card stock embossed with the Boho Background Die which were then stitched together and added to the front of the card. 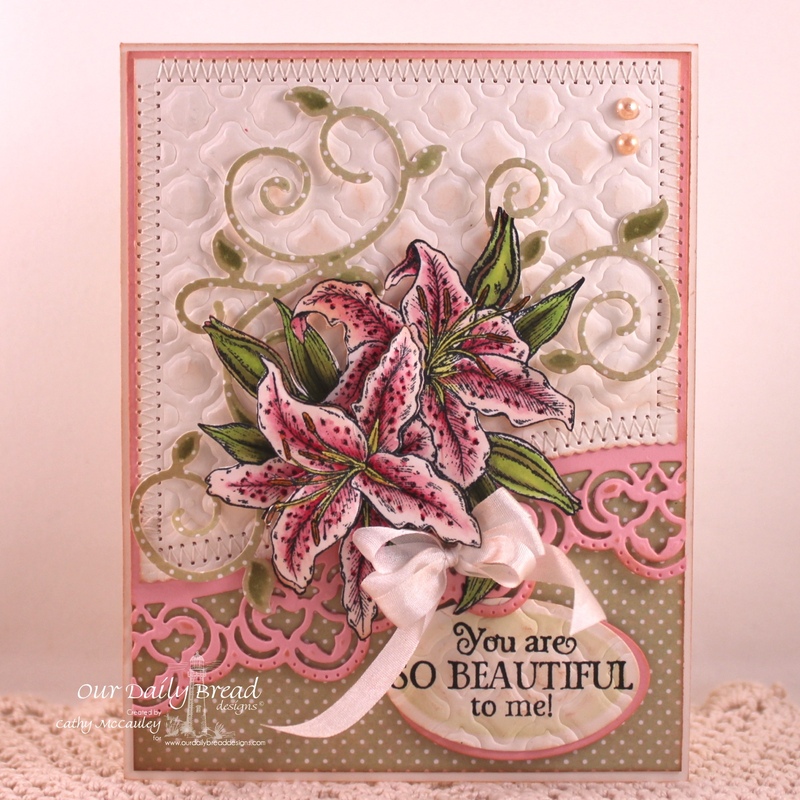 The lilies from the Beauty set were colored with Copic Markers, fussy cut, and added to the card front along with the foliage flourish. The sentiment was stamped on matted Ovals. A silk bow and pearls were added to finish the card. To see all of the breathtaking projects created with the September Mid-Month Release hop on over to the Our Daily Bread Designs Blog. Then click the links below to see the details for each project. You are sure to be inspired by what you see! Cathy * RobinT. * Sabrina * America * Robin C.
Hello, sweet friends! Welcome to Sweet 'n Sassy Stamps September 2015 Release and Blog Hop! We are super excited to be releasing five brand new stamp sets this month and adding four new products from the September Sweet Perks Club to the Sweet 'n Sassy Stamps Store! 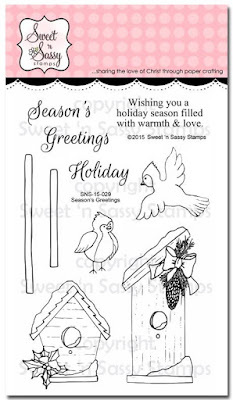 My first sample uses the adorable Season's Greetings stamp set! Creative Nugget: The Echo Park papers and snow drifts cut with the Hillside Edges Dies were matted and stitched together using the design from the Sketch Saturday sketch from this week. The images from Season's Greetings were colored with Copic Markers, fussy cut, and popped onto the scene. The cardinal is sitting on a Fence die cut from the DP. A sentiment from the set was stamped on a matted oval Nestie and a little embossing and chunky glitter were added to give the card a more wintery look. I'm dreaming of a white Christmas with a few cardinals sitting in a snow laden evergreen…or feeding at a birdhouse filled with sunflower seeds. 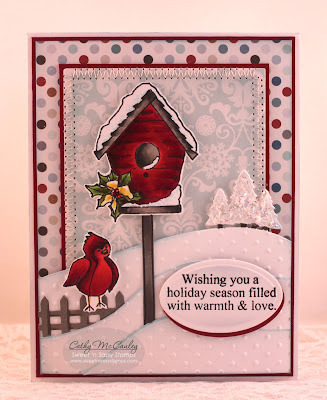 The brilliant red of the cardinal against the pristine white of snow makes a pretty picture, and so will the images from this adorable stamp set. The large birdhouse image measures approximately 3 1/4" x 1 5/8"
My second sample shows how Bible Journaling stamp sets can also be used to create cards making them doubly versatile! Creative Nugget: The background was made by spritzing Dylusions Ink Sprays on a piece of Mixed Media paper that had been sprayed with water. After dry, water was spritzed through stencils to remove some of the ink creating patterns on the background. Gesso was also scraped through a stencil adding more white to the background, and finally white acrylic paint was splattered over the panel. Words from the Words of Life: Collection 1 and Words of Life: Common Words 1 were placed on one large acrylic block and stamped at once to achieve the desired spacing and design. The globe from the Bookmark Bits & Pieces stamp set was then stamped over the sentiment. The globe was painted with Dylusions ink and Wink of Stella glitter pens. A few tiny rhinestones were added for some sparkle. This card will also be submitted for the 200th Word Art Wednesday Anything Goes Challenge Celebration. 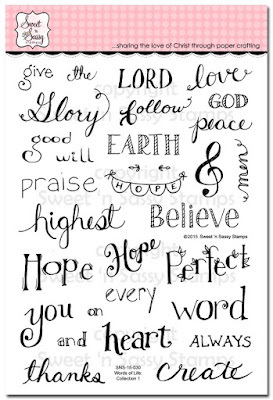 The words in this versatile stamp set can be combined to create many different Bible verses that can be used in your Journaling Bibles. 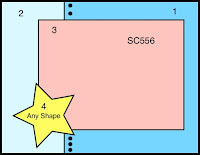 Many of the SNS stamp sets you already have can be used to illustrate the verse. 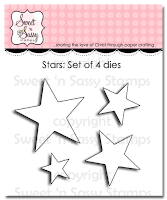 It's hard to make a sentence without using some common words, so this set can be used to complement the Words of Life: Collection 1 set as well as future Bible journaling stamp sets released by Sweet 'n Sassy Stamps. 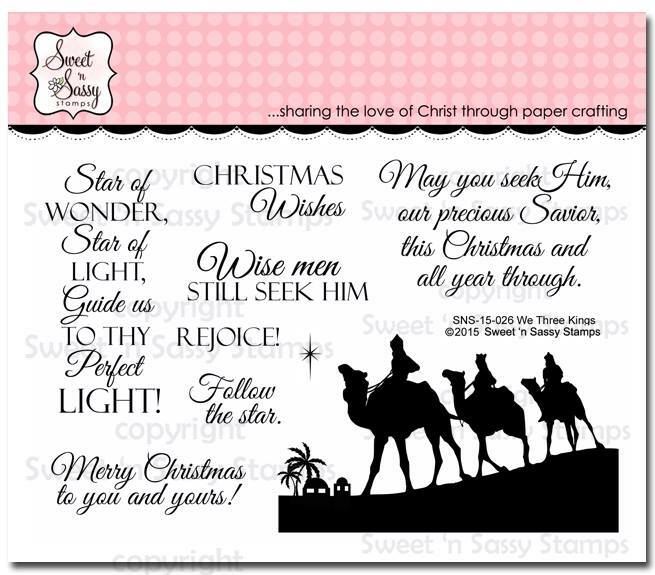 Sweet 'n Sassy Stamps Blog! 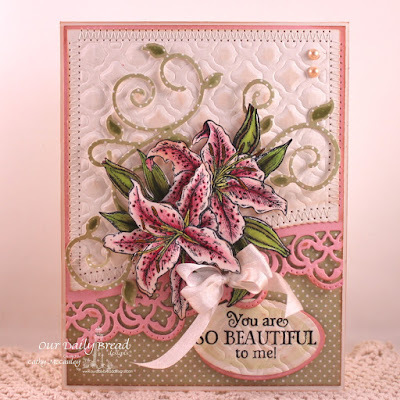 To see more gorgeous samples made by the Design Divas using the new stamp sets from the September Release, click on the links below for our blog hop! Don't forget to leave a little love on each blog as you hop along. Then head on over to the Sweet 'n Sassy Stamps Store to pick up your favorite stamp sets from the release! Hello, Friends! What's in your cup? 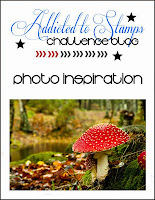 That's the question on the Ways to Use It Challenge on Splitcoaststampers today. I love the smell of coffee brewing, but was never able to get past the bitter taste, so I am definitely a tea drinker, but even more than that I love my hot chocolate! Creative Nugget: The Pick Me Up stamp set and matching Pick Me Up Dies by Sweet 'n Sassy Stamps made this card easy to put together following the Mojo Monday Sketch for the week. Looks like I spilled my hot chocolate, but those splatters you see were really made using the Grunge Elements stamp set. A little stitching and a little twine finish off the card. Ways to Use It 548 - Coffee or Tea? Thanks so much for stopping by…have wonderful Thursday! Have a Hoot of a Birthday! Hello friends! 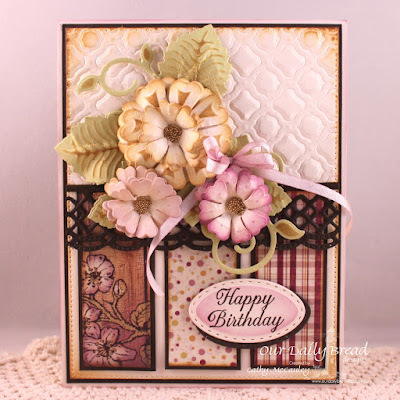 Maria Patrick is the Featured Stamper today on Splitcoaststampers, so I CASEd THIS card to send to my niece who is celebrating her birthday this month. 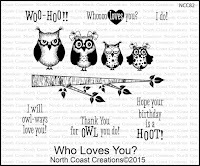 Creative Nugget: I managed to put this card together rather quickly before church this morning thanks to the Owl Family Dies that coordinate with the adorable Who Loves You? 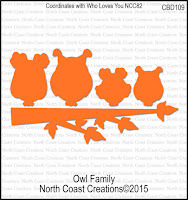 stamp set by North Coast Creations. Just a little bit of coloring, a little stitching, and a lot of die cutting! A sentiment from the stamp set was split onto the two Clouds and the word birthday was replaced by the Birthday die cut. 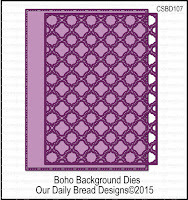 The paper is from the Beautiful Boho Collection by Our Daily Bread Designs. Labels: Birthday, North Coast Creations, Owl Family Dies, Who Loves You? Hello friends! With the beginning of school, fall can't be far behind…and after that...Christmas, so yes, I'm finally starting to work on my Christmas cards for this year! 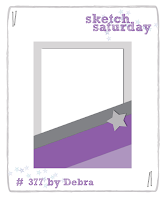 This card was made as a sample for the Sketch Challenge over at Splitcoaststampers today and uses one of the adorable new Sweet Perks Bundles by Sweet 'n Sassy Stamps, Joy to the World. Creative Nugget: The matching dies make a card like this so easy to assemble. The letters were colored with Copic Markers and covered with Wink of Stella shimmer. The stars were cut with the Star Dies, layered, and also covered with Wink of Stella. A little gold cording and some rhinestones finish off the warm festive look of the card. So…have you begun working on your Christmas stash yet? Hope you've been inspired by your visit!